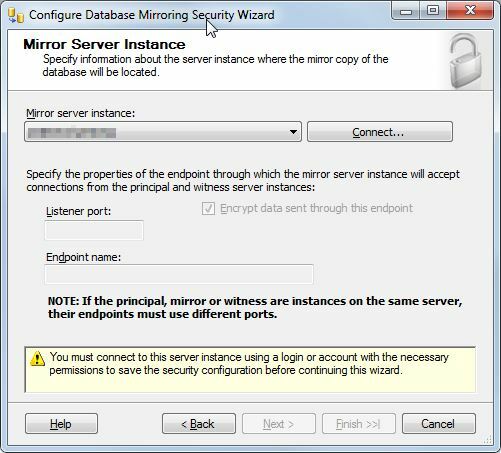 Mirroring a database is not really a hard task to do, you just need this easy and simple 11 steps to start mirrored SQL Server. 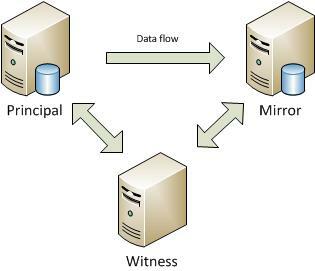 Doing it will not just improve you disaster recovery capabilities on your application but also you are leveraging the high availability database mirroring feature you find in SQL Server 2005 and above, which means it will allow failover of database in the event you lose your main SQL Server. 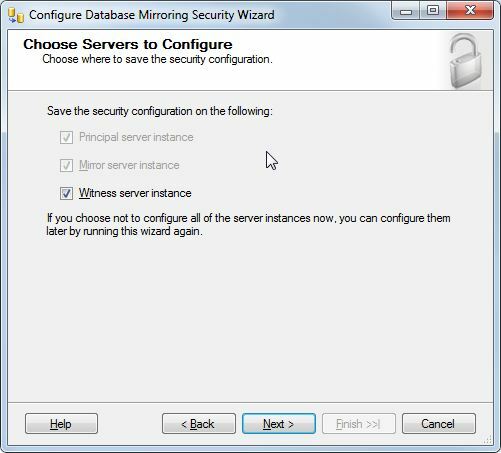 Before starting this be sure that you have 3 SQL Servers in different locations for best result. 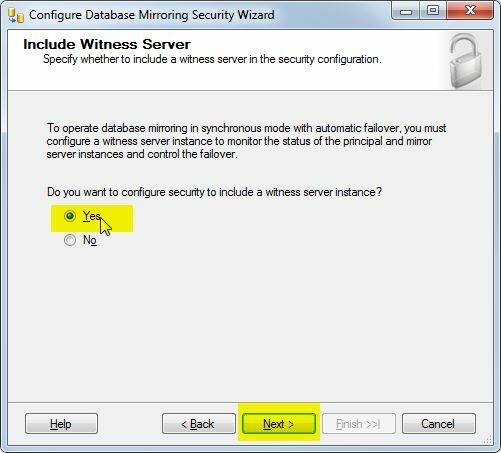 2 Servers need to have the identical SQL Server instance which means same version (either Standard or Enterprise) also its highly recommended that also the service pack and if any cumulative updates are the same on both servers. 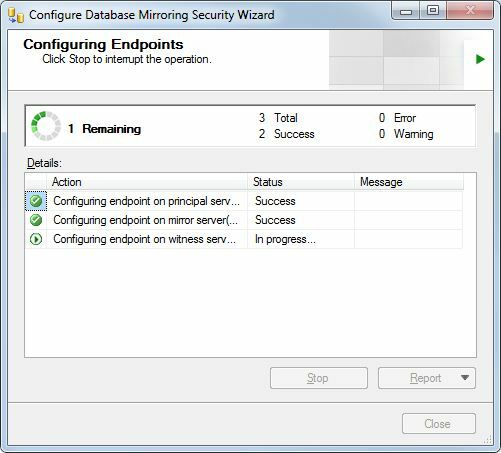 But for the third server it can be SQL Server Standard, Enterprise, Workgroup, or Express. 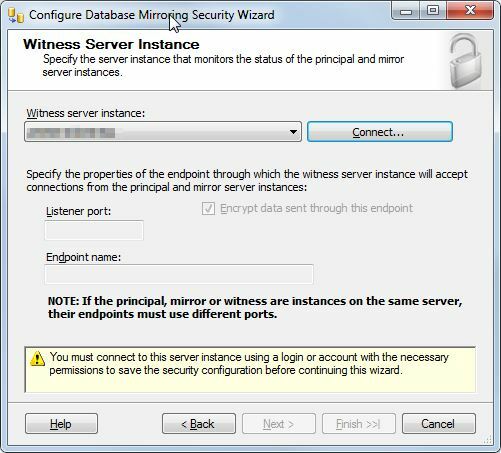 Witness Server will be the one pinging the other 2 servers if there’s something wrong, this is the server that has the ability to recognize whether to initiate an automatic failover, this will not contain any database that’s why its nonsense to use a SQL Server other than Express edition. 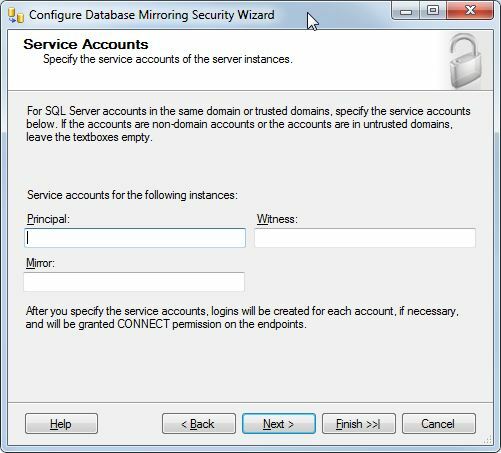 b. SQL Server is using an Active Directory account. 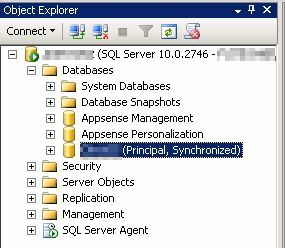 Ideally, use the same account for all SQL Servers. b. 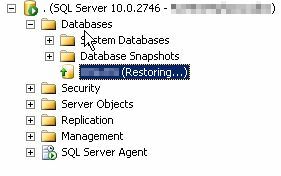 Primary Database is in Full Recovery model. You will notice it’s in a Restoring mode. 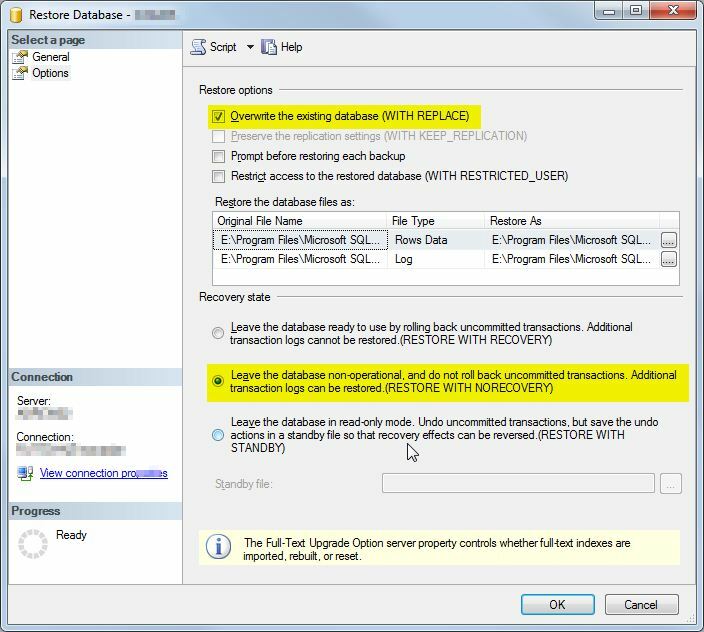 Don’t panic this is normal as you have chosen the NORECOVERY option and it will be in a permanent Restoring state to prevent users accessing the database. It will be only user accessible if the database fails over to the Mirror and now the old Principal will go to the recovering state. 4. 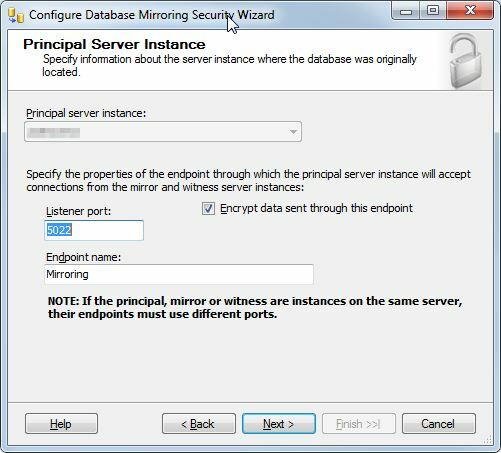 Start the mirroring configuration process on the Principal SQL Server, Right-click the Database –> Properties –> Mirroring and click Configure Security. Hooray! 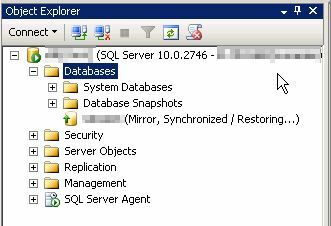 you have mirrored you SQL! Go to both servers and it should look like this now. 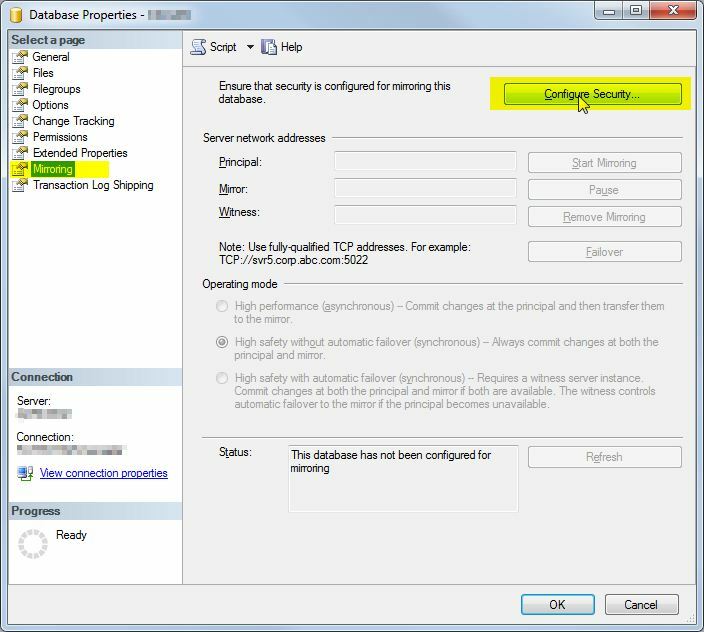 As the error suggest you need to back up the Principal SQL Server Transaction Logs and Restore it to the Mirroring SQL Server using the same restore options when you restored the database. 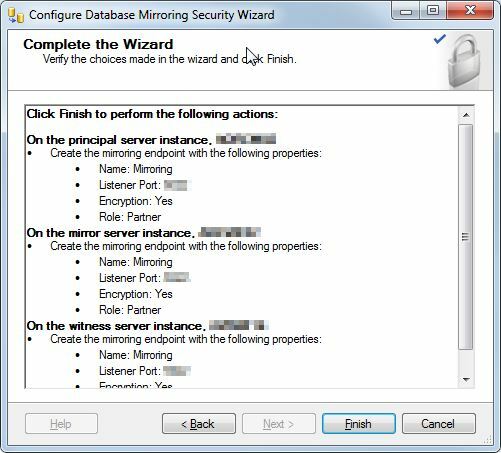 If this happen you can cancel the wizard and start configuring again after this step from step 4.